Janitorial Supply Sales Top Tips! If you’re not selling janitorial supplies to your new and existing, janitorial cleaning accounts, you’re definitely leaving money on the table! When we use the term “Janitorial Supply Sales”, we’re referring to consumable janitorial products that you can sell to your customer. These are NOT the products that you pay for and provide to clean the building with, like glass cleaner, bowl cleaner, furniture polish, etc. 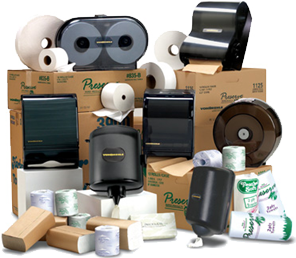 We’re talking about the janitorial products your customer “consumes”, like toilet paper, roll towels, multi-fold towels, trash can liners, air fresheners, some chemicals and soaps. Did you know that 35-40% of all janitorial companies sell supplies to their customers? Every customer you have will need and purchase these consumable products somewhere, so if you can provide them and make a profit, why not let it be from you? Why buy from you? Your customer usually gets their supplies from going to a big box retailer (like Sam’s Club, Costco, etc. ), going to a janitorial supply store, a visiting salesperson or (most expensively) online purchases. The #1 reason to buy from you is convenience and time saving. If they have a salesperson coming to them, they may look more at price, but you’re still making it more convenient and saving them time by going through you and they have a single point of contact to streamline the process. Also, you stock the items for them. Where do you buy? Get your best cost price on these items by shopping around. There are many janitorial supply stores around and all will gladly give you price quotes. Tell them you are getting pricing quotes to resell to your customers. Ask them for suggestions to keep your cost down by using generic brands. Ask them for better pricing if (for example) you purchase 3 or more cases at a time. Ask for terms like 30 day pay to free up your cash flow. Asking won’t necessarily get you a yes answer, but not asking will definitely get you a no. How do you price items? Price it to make a profit! Don’t try to be the cheapest price all the time! Be the best value by offering peace of mind through convenience, time savings, hassle avoidance and reliability. Even if you buy a case of multi fold towels at a big box store for $19.95 and your customer could go get it themselves for the same price, you still resell it for $24.95. They pay for the time savings! I personally, usually go for a “minimum” of 20% percent profit or a minimum $5.00 per case markup. I usually go with whatever gives me the best total profit dollars. For example, a 20% profit on an item that cost me $15.00 would be a total profit of $3.00, so in this situation, I would go with the $5.00 markup and sell the case for $20.00. Remember, these are just recommendations on pricing. If you’re a seasoned veteran when it comes selling your customers supplies, or if you’ve found great low costs on items, you may be able to have much larger profit or a larger $ per case markup. Don’t be afraid to make a profit, you’re customers are getting the added service value of your time (i.e. standing in line to purchase, your gas for travel, your time cost shopping around, restocking, and so on). Establish your costs and pricing: Keep track of your costs from different vendors and set your pricing for future reference and sales to new and existing customers! Our CleanGuidePro.com Janitorial Bidding Software has a section for this (i.e. optional Supply Sales) that keeps records of your items, categories, descriptions, product #’s and pricing so you can easily give your customer a supply pricing proposal! Grow your business and Increase your bottom line Profits with Janitorial Supply Sales!